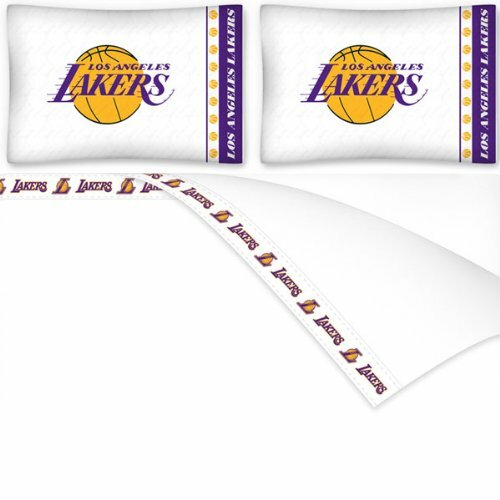 NBA Los Angeles Lakers Micro fiber sheet set KING Lakers , sheets set KING size have an ultrafine Peach weave that is softer and more comfortable than cotton. Its brushed silk-like embrace provides good insulation and warmth, yet is breathable. The 100% polyester microfiber is wrinkle-resistant, washes beautifully, and dries quickly with never any shrinkage. The pillowcase has a White on White print beneath the officially licensed team name and logo printed in vibrant team colors, complimenting the new printed hems. The teams are scoring high points with team-colored logos printed on both sides of the entire width of the extra deep 4 1/2" hem of the flat sheet. The flat sheet is 102" x 105"and the fitted sheet is 78" x 80" and 14" pocket. Weight of fabric is 92GSM. The KING sheet set will have two standard size pillowcases. Made in China finished USA. Golden State Warriors NBA Licensed Classic "Comfy" Fleece Throw Blanket 50x60"